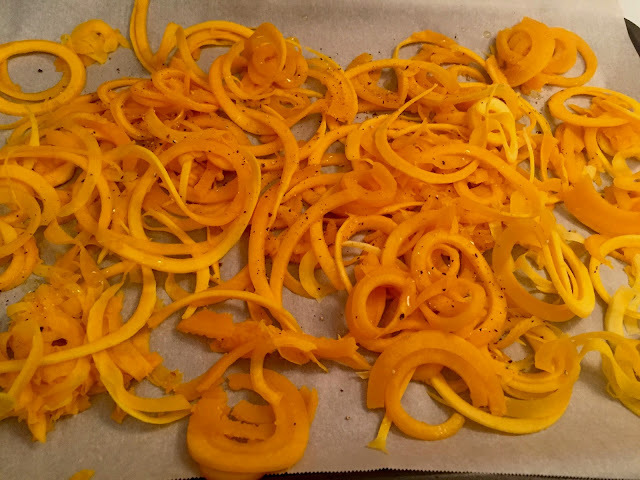 Usually when I think of using my spiralizer I always think of making zucchini, but a friend of mine said he was going to make squash noodles and I thought I would try it out. I had a whole bunch of butternut squash from my CSA to eat up. I read a few different recipes and articles. Key takeaway is that you can only use the long skinnier part of the squash (save the rest for a soup). I also found that after peeling the squash, it's good to microwave it for a few minutes to soften it enough so the spikes in the spiralizer can grip on. 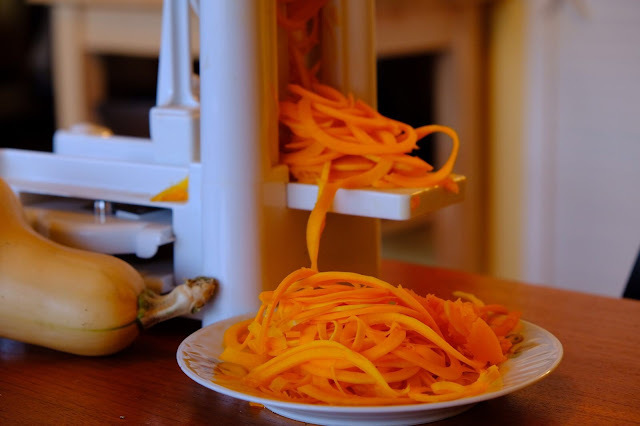 If you don't have a spiralizer or it's too much effort, many grocery stores sell pre-made boxes of spiralized squash. Not too overpriced surprisingly and skips a lot of the hassle. Once your squash is spiralized you can fry it or roast it. I drizzled it with olive oil, seasoned with salt and pepper and roasted at 400 for about 10 minutes. We topped with Stefan's homemade Bolognese meat sauce and it was delicious. I am a pasta lover and even i didn't miss it. Stay tuned for many more squash recipes and some other ones from new cookbooks I got at the Food Blogger's conference. I've been really busy at work and at night haven't wanted to be on the computer much, but i've been cooking a fair bit and want to share some of the recipes!